Last season, it always seemed like the Chicago Blackhawks and Arizona Coyotes would engage in high-scoring, high-anger contests. So here’s our setup for tonight’s game between the teams: Neither squad is scoring much, and both have plenty to be angry about. 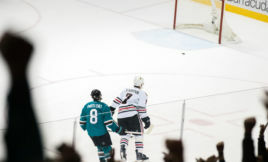 The Blackhawks have lost three consecutive games in regulation for the first time this season, the latest defeat coming with a 3-1 setback against the San Jose Sharks on Tuesday. The Blackhawks weren’t bad in the loss … it just seemed like they were playing for a point down the stretch. Meanwhile, the Coyotes are in full-on rebuild mode, which leaves them as one of two NHL teams without 40 points yet this season. Granted, the Coyotes’ 38 points are far better than Colorado’s 28, but it’s easy to see things aren’t going well in the desert. Arizona is a pretty lackluster 11-12-2 at home this season, and the team has a goal differential of negative-45. So while the Coyotes do have some things to look forward to (as pointed out by Howlin’ Hockey’s Alex Temes in this week’s “Eye on the Enemy“), this is a team the Blackhawks should do away with easily. 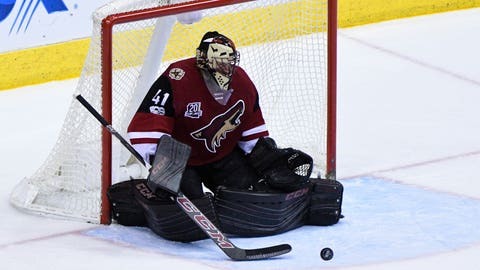 And that happened earlier this season at the United Center, as Chicago beat Arizona 4-0 behind a 22-save shutout from Scott Darling, two goals from Marian Hossa and single strikes from Artem Anisimov and Dennis Rasmussen. So there’s a good bit to talk about here. Schmaltz will remain on the top line with Toews, while it appears Hossa will go back to the third line and Panik will return to the top three after a one-game hiatus. Coach Joel Quenneville is clearly just throwing things at a wall to see what sticks right now. Against Arizona, you can probably get away with that and two points. After splitting Panarin and Kane for some of Tuesday’s loss, they were back together this morning. We’ll see how long that last in the actual game. The third line at practice actually included Vincent Hinostroza for Hossa, who was taking a maintenance morning. I’m not sure if that means Hinostroza is scratched, but I’m hopeful he’d slot in for Desjardins on the fourth line, as that makes far more sense. A fourth line of Hinostroza-Kero-Hartman could be a solid bottom-six threat. Also, Kruger is back in the lineup after missing the previous game. That’s always good for puck possession, something the Blackhawks continue to struggle with. The defensive pairings aren’t clear, but we can all hope Michal Kempny draws back into the lineup. He probably won’t, but we can hope. Otherwise, you’ll see some combination of Duncan Keith, Niklas Hjalmarsson, Brent Seabrook, Brian Campbell, Trevor van Riemsdyk and Gustav Forsling. Corey Crawford gets the start in net. Now, this lineup is subject to a pretty important change. According to Coyotes beat writer Sarah McLellan, Domi is a game-time decision. He’s been out since December with a broken hand, but could return for tonight’s game. Rieder has been playing with Hanzal and Vrbata up top, while the second and third lines have been a little different than they are above, with Josh Jooris suffering the healthy scratch should Domi return. Vrbata, constantly a Blackhawks trade target, is the only guy on the team with more than 30 points (34). So you can see how bad of shape the Coyotes are in offensively. They do have guys who can produce — or at least they could in the past. None of them are doing much producing this season. Just be wary of the likes of Rieder, Hanzal and Domi, should the latter return. Ekman-Larsson is a solid blueliner, and guys like Stone, Chychrun and Murphy have shown flashes. But this is a group that really, really struggles to hang on to the puck. As in, the Coyotes are dead-last in the league in 5-on-5 Corsi-for (46.24 percent). Take a young team and have it struggle to maintain possession, and you’re going to see what’s in Arizona this year. World’s Greatest Actor (TM) Mike Smith is trying to hold up this operation. He managed to make the All-Star Game out of the Pacific because the Coyotes needed a rep. His .917/2.86 statline obviously isn’t good, but it’s probably better than what some others would produce behind a team this bad. The Coyotes … they’re bad. I mean, the Blackhawks have given up a bajillion shots to almost every opponent this season, and they allowed just 22 to Arizona in the last meeting. Now, the Blackhawks have shown if they’re not awake against even bad teams, they can fall behind (recall the Colorado game a few weeks ago). And this game is on the road, where the Blackhawks won’t have last change. That being said, the Blackhawks are just a far better team than the Coyotes right now, regardless of whether Domi plays for the hosts. While there might be some nastiness in this contest, I think the Blackhawks will look past that and get back on track. I’m going for a 3-1 Blackhawks win.